After watching Iron Man, we have all at one point in life or another, wanted a robotic suit that would give us super-human strength. Technology of the 21st century might have achieved that milestone. 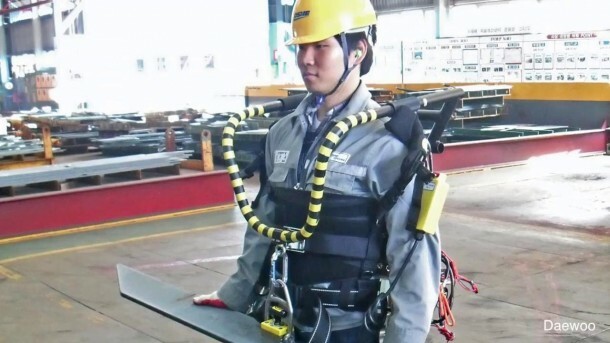 In South Korea, at a sprawling shipyard, workers attired in robotic suits were spotted carrying huge pieces of metal, pipes and other such objects as if they had no weight at all. This was in fact the outcome of a test carried out by Shipbuilding and Marine Engineering the year before at their facility in Okpo-dong. The giant among shipbuilding companies in the world, now intends to take production to a higher upgraded level by equipping the entire staff with super human strength imparting robotic exoskeletons. 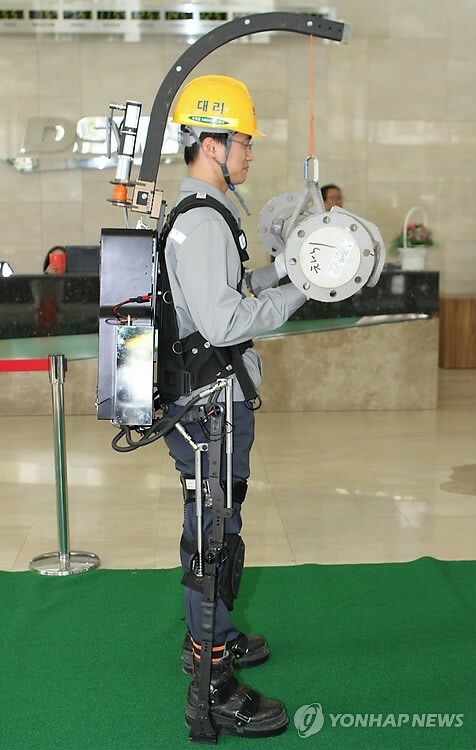 The head engineer for the firm’s R&D arm, Gilwhoan Chu, stated that the pilot project proved that the exoskeleton does help workers in performing their tasks more efficiently. He and his team are currently working on improving the prototypes to make them suitable for regular use in the shipyard. This would not be an alien concept since robots already run a major portion of a hugely complex assembly system. The robotic exoskeleton is designed to perfectly fit anyone between the height of 160 and 185 centi-meters. What is even more interesting is that although this frame of carbon, aluminium alloy and steel weighs about 28 kg, workers do not feel it, since the suit is engineered to support its own weight and adapt to the wearer’s movements. Having a battery life of about 3-hours, the suit does not hamper the user’s normal pace of walking, and allows him to lift objects as heavy as 30 kg in its prototype form. Putting the exoskeleton on is not as tricky as you might assume. The worker begins by strapping his feet on to the basal foot pads of the robot. Additional Padded straps at the waist, thighs and across the chest bind the user firmly to the suit, allowing for movement of the robot with the user’s movement while lifting heavy loads. A series of electric motors and hydraulic joints runs along the outer side of the suit connecting the legs to the power supplying backpack. Customized frames designed specifically for individual tasks can be attached to the backpack. In addition to boosting raw lifting capability, the suit allows the worker to manipulate heavy components precisely. This essentially means that it takes over most of the weight letting the user lift only a small portion of it. 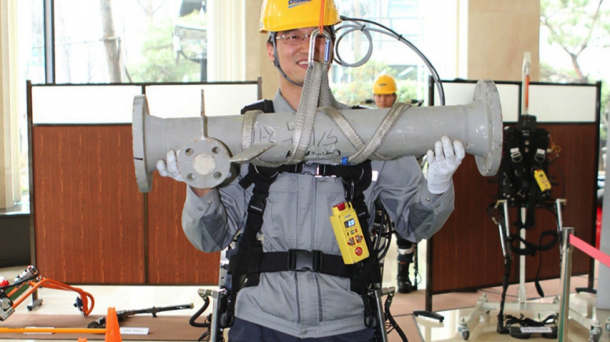 Chu claims that the user feedback of the prototype has been majorly positive because the users were glad to be able to lift heavy objects without strain under the effect of the robotic exoskeleton. Speed still exists as an issue which Chu and his team are working on in addition to allowing the suit to be able to lift even heavier objects.”Our current research target of the lifting capacity is about 100 kilograms,” he says. The world’s biggest shipbuilding firms are South Korean, namely Daewoo, Hyundai Heavy Industries and Samsung Heavy Industries, and their shipyards are renowned around the world for their degree of automation. In a study investigating the firms’ facilities in 2012, US Navy personnel unveiled that five out of the six yards they visited, made use of robots in one capacity or another. At one specific shipyard, robots were responsible for 68 per cent of all welding as well as carrying out worker jobs including cutting and grinding of steel and polishing of assembled hulls, with little to no human supervision. All this automation is what allows for the building of truly gargantuan vessels. Daewoo has a contract worth $1.9 billion with Maersk to build 10 55,000-ton container ships for the firm, each having a length of 400 meters and space for 18,000 containers. “Largest of their kind ever built” would certainly not be an understatement here. As the industry grows, so does the experimentation with automation.. The prototypes however still exhibit a few glitches that need to be taken care of, such as having a firm grip on slipping or sloping surfaces and allowing for the exoskeletons to be able to effectively cope with twisting movements. Yet, Chu and his team are committed. “We’ve been developing and applying robots and automation in shipbuilding for more than a decade,” he said. If things work out as he plans, the era of robots might not be all that far away. AT least not in the shipping industry where humans will soon be able to lift heavy ship parts that probably weigh more than they do, without any strain.